Heather Rutt and Ryan Schamerloh met during college, and their relationship remained platonic for quite some time until an unexpected kiss proved they were much more than friends. 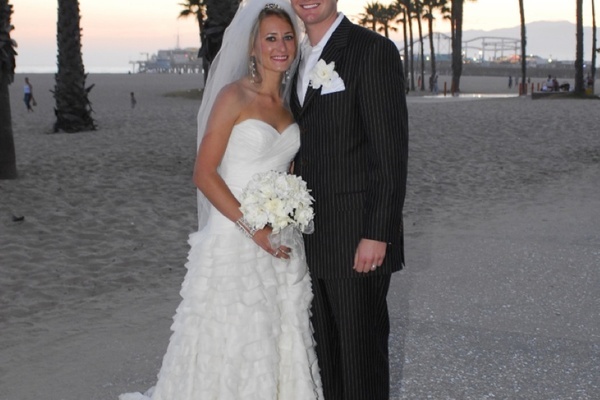 Ryan eventually asked Heather to become his wife on bended knee while the two were vacationing in Hawaii. 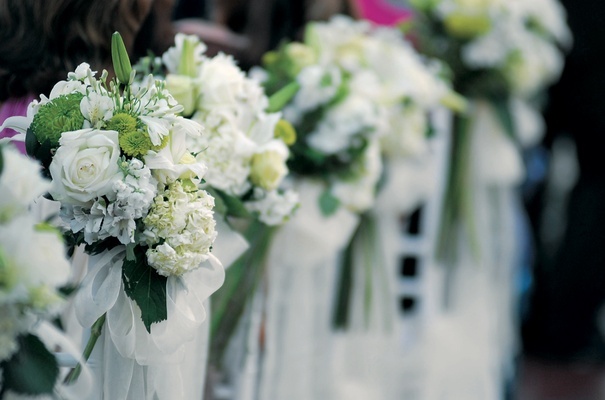 Planning for their July 2nd wedding began almost immediately, thanks to the long distance teamwork of Dallas-based event planner Debbie Vaughan, California-based wedding coordinator Mary Dann-McNamee, and Heather’s mother, Janelle Friedman. 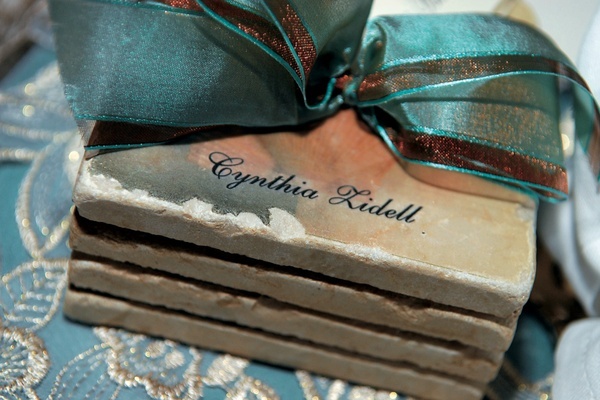 The invitations set the elegant tone for the beachfront event. Each was presented in a bronze and turquoise silk envelope fastened with a shell and was hand-delivered to every guest via messenger. 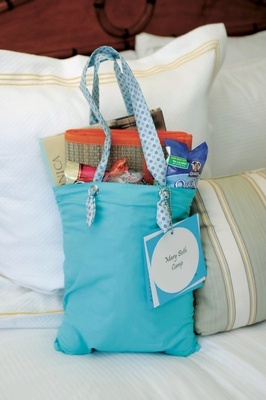 When friends and family arrived in Santa Monica for the big day, they were welcomed with personalized tote bags filled with beach mats, snacks, and historical books about the city. 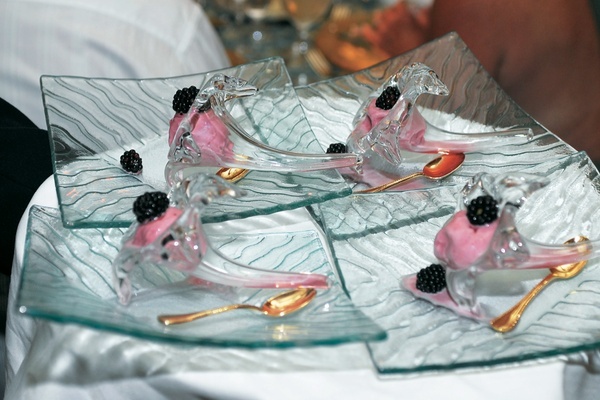 A cocktail party before the ceremony at Shutters featured a caviar bar sculpted from ice and signature White Wedding Cosmopolitans (garnished with turquoise cherries) and allowed guests to gather and enjoy the summer weather while they waited for the sunset service to begin. 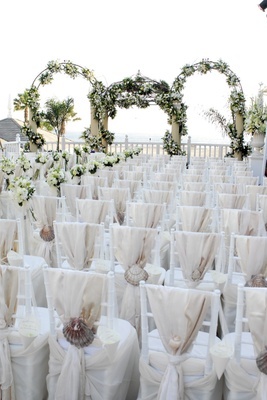 Each chair at the ceremony was draped in fabric and fastened with a giant seashell or starfish. 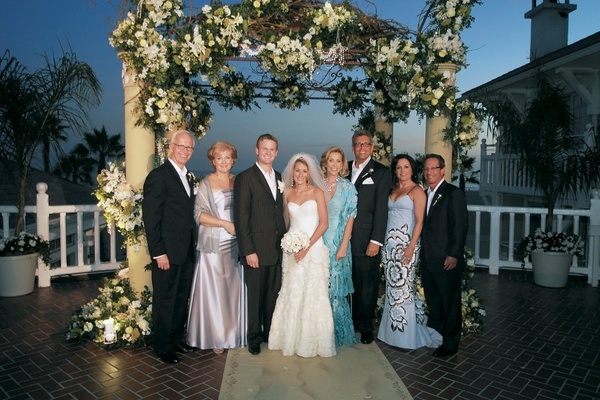 Ryan stood beneath a chuppah covered in flowers and shells, while his bride made the walk from one hotel to the other. A choir sang “Isn’t She Lovely” as she approached, transitioning into “This Little Light of Mine” when she met up with her father just before walking down the aisle. Heather carried a bouquet adorned with vintage family brooches and was married with her grandmother’s ring. After Heather and Ryan were pronounced husband and wife, the choir led the way to the reception with a joyful rendition of “Love Train.” The entire group walked along the sand and beneath an archway of ribbon created by forty men holding eight-foot long batons. 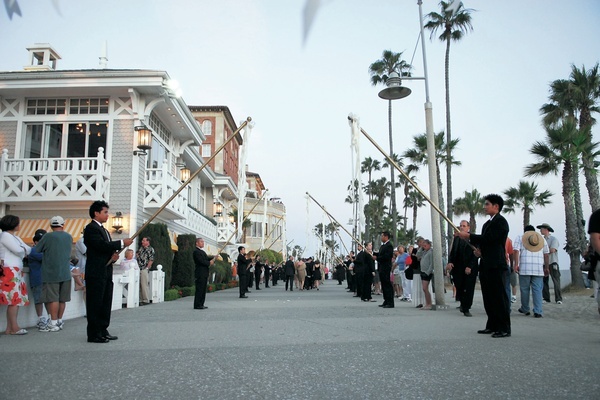 At Casa del Mar, everyone was greeted with another cocktail hour before adjourning to the reception. In lieu of regular place cards, seat assignments were attached to sets of personalized stone coasters, which also served as favors. 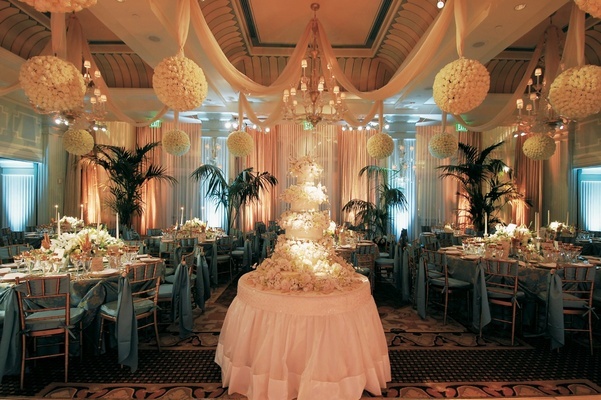 Inside the ballroom, the tall centerpieces of white roses were mirrored by three-dozen tightly packed “kissing balls” that hovered overhead. 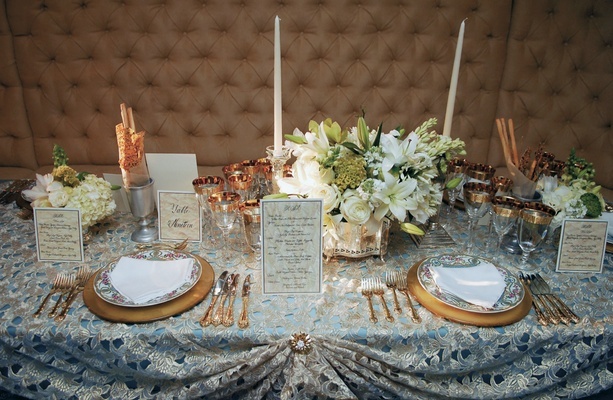 An eight-course meal paired with wine and French champagne was served, including two types of wedding cake. 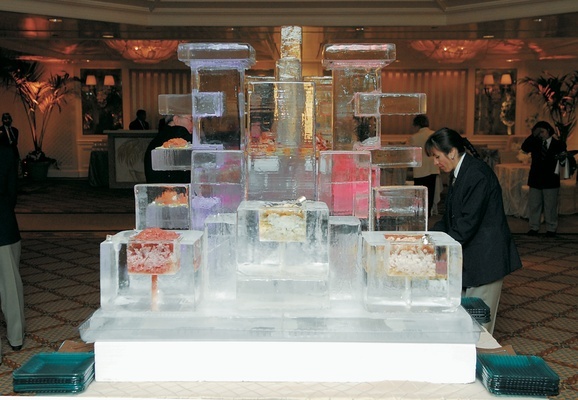 One was sliced from the couple’s traditional wedding cake, a seven-foot tall design by Sylvia Weinstock, which was completely covered in sugar shells and starfish. Guests also indulged in their own personal groom’s cakes made in fourteen different ocean-inspired designs. The dance floor, which was painted with a fleur de lis and the newlyweds’ shared monogram, was the ideal place to work off the incredible feast. The after party began at one o’clock in the morning, boasting a late-night menu inspired by the Fourth of July. Cigarette girls dressed in thematic costumes distributed red, white, and blue candies, and each guest received yet another miniature cake in honor of the holiday. Not long before the sun was to rise, Heather and Ryan were given a storybook sendoff. 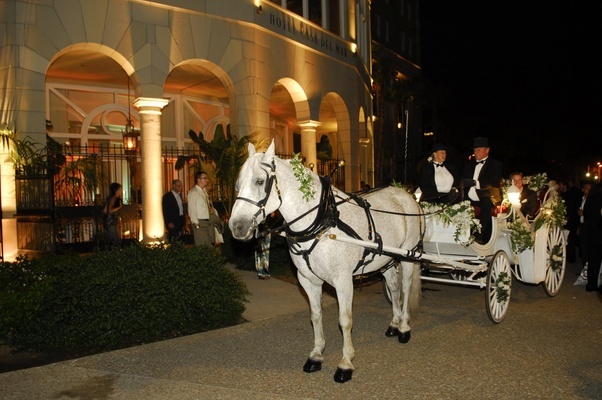 With sparklers in hand, their guests waved farewell to the newlyweds as they rode away in a horsedrawn carriage.